Do you remember those kool-aid ice shavers? I remember making some pretty tasty snow cones with one when I was kid. My son and I wanted to try some home-made snow cones, but we didn't have a handy kool-aid shaver. Do they even make those anymore? We tried out two different methods and both turned alright, although one was better than the other. But I'll show you both methods, just in case. 1: Make up a pitcher of kool-aid. The snow cones turn out better if the juice is more concentrated than normal. So we just added a bit less water. 2: Pour the juice in ice cube trays and let it freeze solid. 3: Remove the kool-aid cubes and use either of the two methods below to crush them up. This one didn't work as well for us. Maybe if we had a different blender it would have worked. But as it is, we ended up with large chunks of ice. I couldn't get it all chopped up finely. Sounds kinda crazy, but this one actually worked better for us. 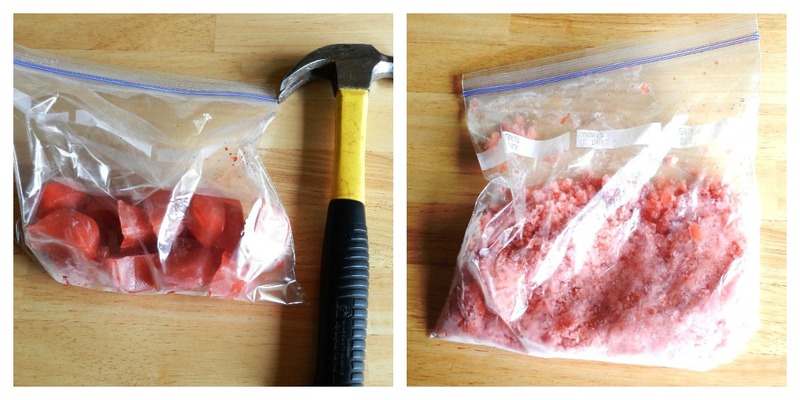 Just stick the kool-aid cubes in a plastic bag and whack em' with a hammer. You can smash the cubes as much as you want and it's fun for kids! Presto! Home made snow cones! Great idea! Going to try this one with the kids tomorrow. Great idea! And so easy! My kids are going to love this! Thanks for such a great tutorial. I bet it would work with Crystal Light too :) I know Target sells ice shavers in the summer for snow cones. Thanks for sharing at Creative Thursday last week.